Original, Limited Edition Hiroshige prints - We are excited to offer a fantastic group of rare original Hiroshige prints from their first and only printing in the 1970's. Hiroshige created the designs for this group, but they were never printed during his lifetime. They were intended for Edo era release, however, the sketches were never published. 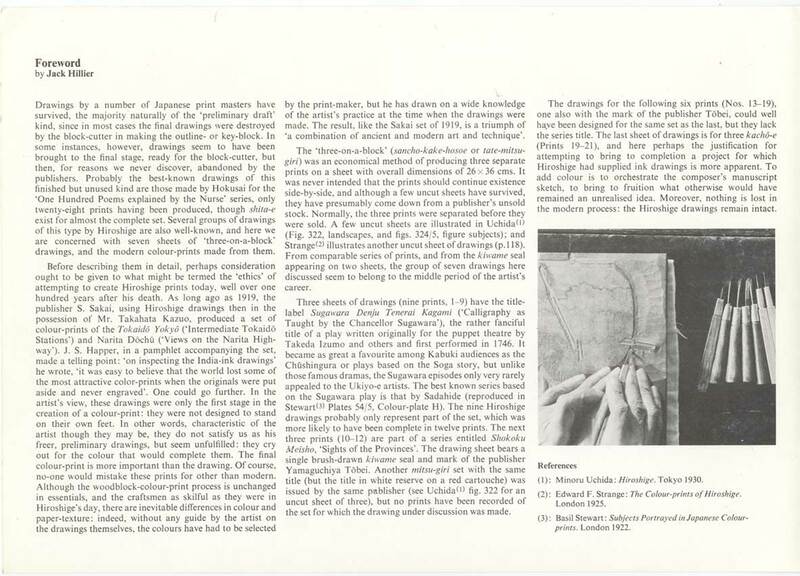 In the 1970’s, Robert G. Sawers learned of the existence of these 21 original drawings and expertly produced the only edition of this group ever released. He limited the production to only 250 prints of each design. Included in this first edition group are prints from a series titled "Calligraphy as Taught by the Chancellor Sugawara," prints intended for a series entitled "Sights of the Provinces", as well as several rare kacho-e designs by Hiroshige. Originally conceived during the height of Hiroshige's creative output, this series is an absolute masterwork and a must-buy for any serious Hiroshige collector. Limited to only 250 prints, this is an extremely rare series - don't miss this opportunity to acquire a beautiful original Hiroshige print from this most unusual group. You just won’t find these prints elsewhere, so bid now! Collection Information - Each print is presented in an individual windowed paper folder with the limited edition number in pencil on both the reverse of the folder and the reverse of the woodblock. The set was released with a scholarly, introductory foreword by noted expert Jack Hillier. Please see below for Hillier’s forward and description of this project (a photo copy of this will be included with each print). 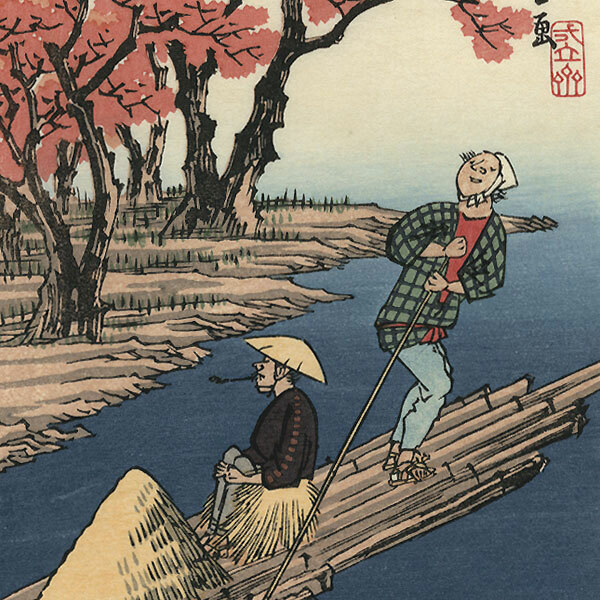 Yamato Province, Tatsutagawa - Terrific scene of a boatman happily poling a raft down the river, a passenger sitting sideways to take in the view while smoking a pipe. Cherry trees bloom in a riot of pink along the riverside and edging the hills in the distance. A lovely spring landscape. Condition - This print with excellent color and detail as shown. Slight toning, light toning and spotting on inside of folder. Please note, each print is "tipped in" to the windowed paper presentation folder with two very small spots of wheat paste at the upper reverse corners, exactly as originally produced. The print can be easily removed by the collector if desired.